Natalie Motley competes at the world inline free skating championship. 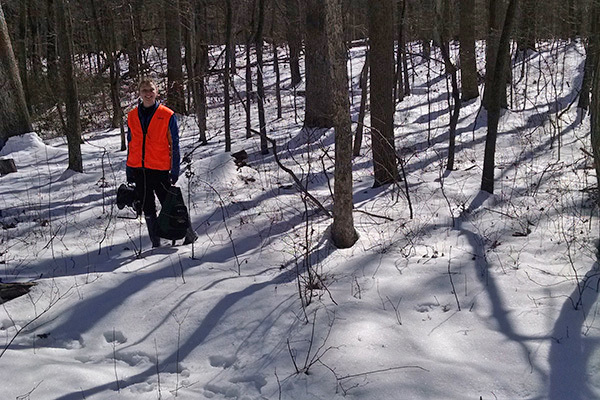 Natalie Motley conducts research this winter. Natalie Motley wins the gold at the world inline free skating championships. 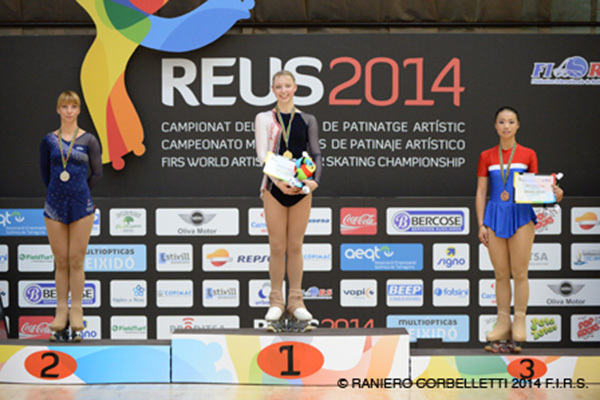 1:05 p.m., April 6, 2015--When University of Delaware student Natalie Motley went to her friend’s birthday party at a roller rink as a child, she never would have guessed that it would eventually lead her to skate in competitions all around the world for Team USA. But Motley said that as she went around the rink and stared at a wall of pictures that had skaters in their competition outfits, she knew what she wanted to do with her life. Motley is now studying to earn her associate degree in agriculture and natural resources at UD while at the same time majoring in environmental geology to receive a bachelor’s degree at the University of Mary Washington in Fredericksburg, Virginia. She is also the reigning world champion in women’s inline free skating and has competed in eight world championships, earning one gold, one bronze and four silver medals along the way. In addition to the medals, Motley has had an opportunity to see the world, traveling to competitions in Taiwan, New Zealand, Brazil, Germany, Italy, Portugal and Spain. Motley also competes in events outside of the world championships and in 2014 she won the International Trophy of Artistic Roller Skating in the senior ladies inline event in Italy. 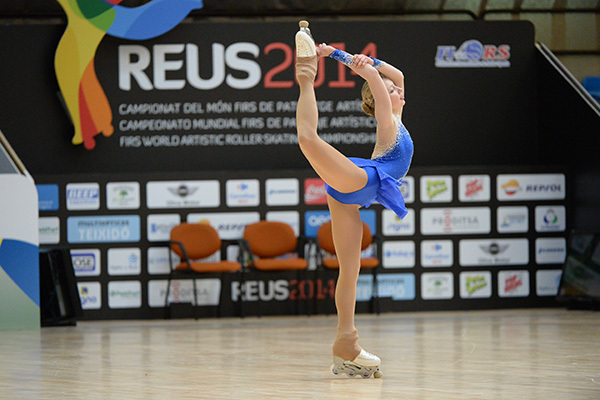 She also won gold in the world class ladies inline free skating event at the 2014 World Artistic Roller Skating Championships in Spain. Motley is part of the UD Intercollegiate Figure Skating Team, where she is coached by Joel McKeever, and she also takes ice skating lessons from Suzanne Semanick. The UD team won nationals last year, won a recent competition on home ice, and has qualified for nationals once again this year, which will be held April 10-12 in Berkeley, California. With roller skating, ice skating and a full college workload, Motley said that the hardest part of her day is just staying awake, as school work and her training schedule can sometimes keep her up until 4 in the morning. “One day I got about an hour of sleep and then I went to practice and I had an awesome practice and I was like, ‘Whoa, that’s surprising.’ Then the rest of the day I was pretty good but by the time I got home, I was really tired,” said Motley. As for her day-to-day routine, Motley said that she does ice skating in the morning, roller skating in the afternoon  except for Tuesdays when she has a class from 3:30-6  and classes and studying in between. Like her affinity for skating, it was also as a child that Motley first developed an appreciation for agriculture, as she traveled every summer to her grandparents’ farm in Illinois where they grew corn and soybeans. At UD, Motley is conducting research with Bruce Vasilas, professor in the Department of Plant and Soil Sciences, at Blackbird Forest in Smyrna, measuring about 23 wells to examine the hydrology of the site. Motley said the researchers are using IRIS tubes -- PVC piping coated with a specifically formulated iron oxide paint -- to determine how anaerobic the soils are in the forest which is a key indicator of a hydric soil. Motley also checks herpetology boards for signs of a certain species of lizard whose population has been dwindling. “If I see one of those, I take a picture so we can send that in. But I haven’t seen any yet. I think it has been too cold,” said Motley. As for her future career plans, Motley said that she hopes to pursue a career in agriculture with either the U.S. Department of Agriculture or the Environmental Protection Agency. She also is considering going on to get her master’s degree or heading to Illinois to be closer to her grandparents’ farm. As to skating, Motley said she will definitely keep roller skating for at least another year.